Today is when the fun starts. Time to pull the old system apart, figure out what’s what, and install necessary circuits in the new panel. Some things can be removed…there was an electric stove feed for the second kitchen for example. It’s coming out as we’re not keeping a second kitchen (it will be a utility room instead), we’re not going to put in an electric stove, and it was not done particularly safely. Another example, the dryer service will be redone and relocated and we’re not currently using it, so it can be removed as well (and so on). 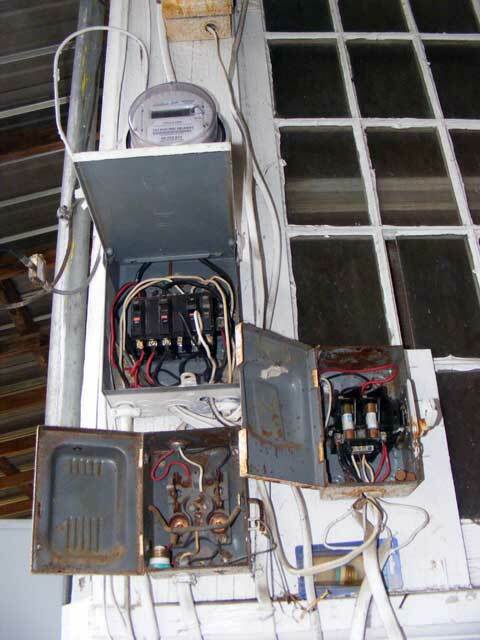 Lots of sins are illustrated in the picture above…small gauge wires wired right into the mains for sub panels (exposed wiring, no fuse protection), multiple wires in single lugs, over-sized fuses and breakers for the particular wire attached (undersized wiring for some feeds…like the stove). I systematically pulled everything out, figured out what it was/fed, tagged it accordingly or removed it, and removed the extra fuse boxes as I went. This was made more difficult by several factors. 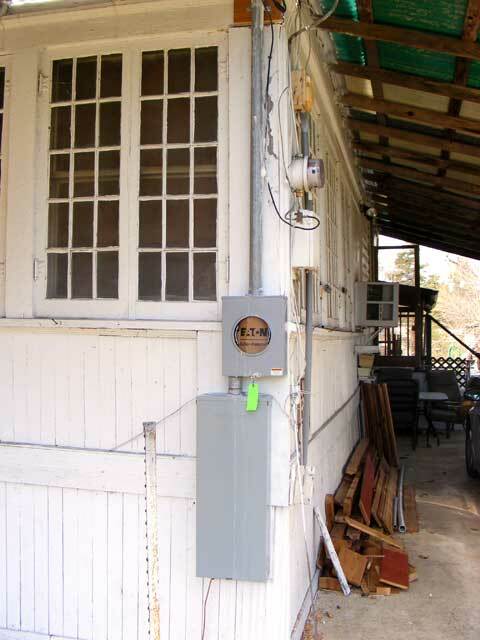 There is no earth ground on the house…and the neutral connection was a bit corroded, resulting in a high resistance connection. This basically results in voltages being present in places they should not be…mostly very low amperages, so really not as dangerous as it seems, but it can be…I could read 50 volts on many circuits that were shut off for example, as voltage from lights and such that we had on (even something as innocent as a clock) was seeking a way to a good ground and “feeding back” through other things connected to the circuit. 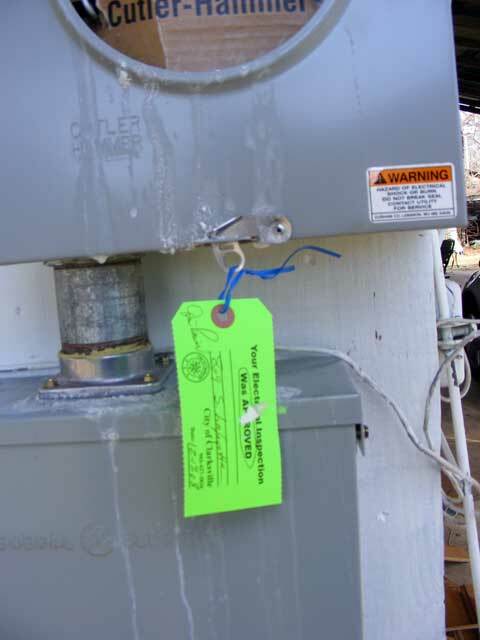 How about 65 volts on the metal clothes dryer case? Not a great thing. These issues are all corrected now. The 8′ copper ground rod hammered into the ground for the new service, as well as new, fresh, and corrosion protected connections will take care of this problem in the future. The other thing I found was that the “bakelight” plastic in the old fuse boxes was breaking down and actually conducting electricity. Again, low voltages/amperages, but measurable. High humidity and 50 years+ of dirt and dust probably contributed. Two of the fused circuits were “neutral protected”…ie the hot was not fused but the neutral was…a dangerous practice, as when the fuse is removed or blown, the circuit is still “hot” if you happen to find a good path to ground. It was not uncommon in the past to fuse both the neutral and hot…again, a dangerous practice that has not been used in 50+ years or more, but it was never correct to only fuse the neutral. This was an error…and a dangerous one. The breakers were for the added window AC units as well as the stove and dryer. Most can be removed as we are changing them up and do not need them in the meantime. One wire left…and I am highly entertained that every light and plug in the house still works. I eventually found the “crossover” and broke that one circuit into three…two for plugs and one for lights. These three circuits were all that was installed in the new box. Note, even these will get replaced, but we need them for now. The new service riser...complete with Green Taggage! 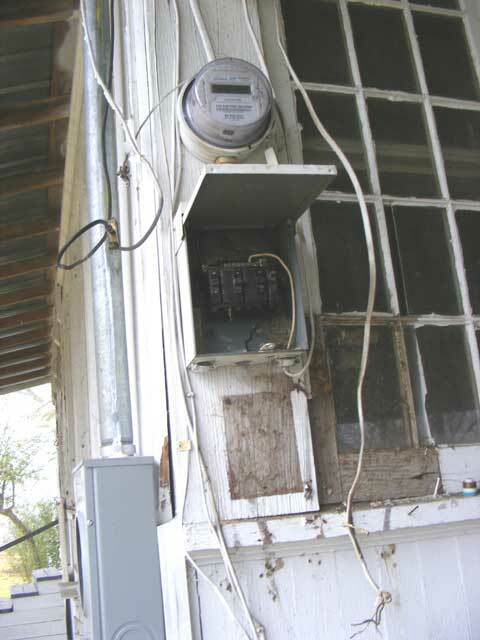 Next, the power company needs to switch to the new service riser. That’s scheduled for Friday morning. Let me just say…deregulation has not been kind to the power system/situation here in Texas. 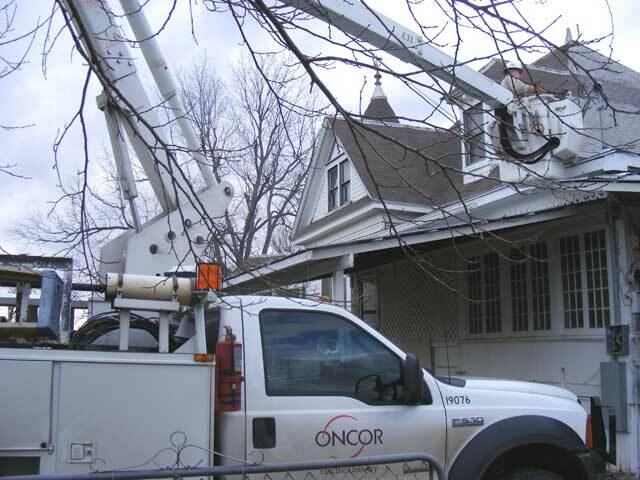 Please note, the Oncor guy…the one guy that actually does the work in our area…is VERY competent and efficient and I have only good things to say about him. Getting to the point where he could come and do the work was a frustrating mix of hours on the (cell) phone…sentenced to voice jail, trying to work my way through established bureaucratic procedural nonsense, and a system that is designed so that nobody is responsible for anything. The service guy went above and beyond to get our situation resolved. Suffice it to say, I mysteriously acquired his cell phone number, and he took care of us. Seriously…more man hours were spent…by a factor of about five…to get the service change ordered than it took an actual working man to get the job done (including drive time)! Soooo…Oncor arrived and pulled our old service. In a matter of about 10 minutes, he had us hooked up and running on the new riser. Yeahhhhh! Full power restored! The Oncor guy...hooking up our new service riser. I can now comfortably run higher loads without the worry that the entire service entrance may blow itself off the house at any moment. Phew! How incredibly handy...that bucket truck. I have to comment as well…that the state of the art in service tools has come a LONG way since I did this kind of work. The bucket boom arm is insulated! In other words…there is a non-conductive section in the boom at any extension length. Way cool. Also, the service guy had this nifty battery powered electric/hydraulic crimper for crimping the wires together…very nice (the tool we had when I was doing it looked like a pair of bolt cutters and was powered by long handles and muscle…sometimes an issue when tangled up amongst live wires in a swaying bucket high above the ground. 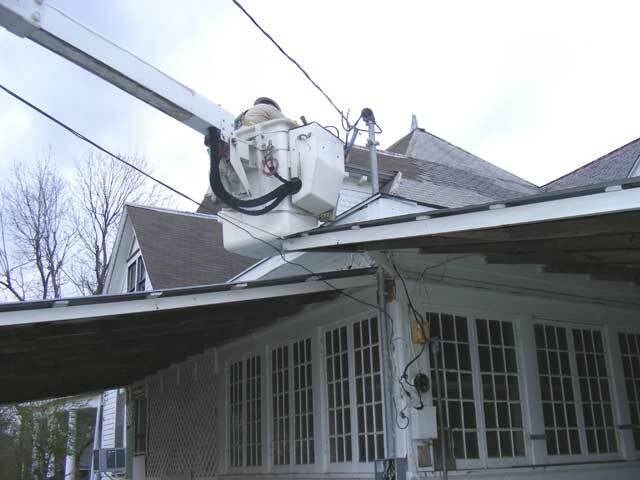 Yah…you know you’re on old house owner when you find yourself lusting after a boom-arm. Anyway, that’s the end of this project, having…just so far…taken about 12 hours of work (over two weeks) longer than it should have. Ah well, at least we’re moving forward.